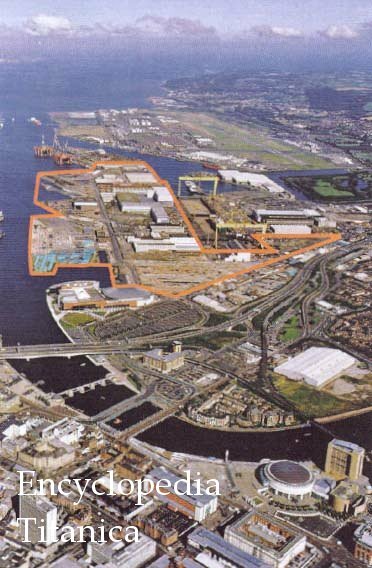 PLANS for the development of 185 acres of dockland in Belfast that include the cradle of the Olympic and Titanic have just been formally announced. 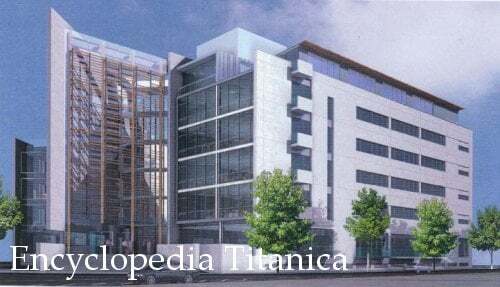 Most of the Queen's Island site will be transformed over the next seven years in a £1 billion (€1.46bn, or $1.8bn) building programme, but the most sacred places to Titanic aficionados will crucially be retained, if changed. An aerial view of the near 200-acre site, where Titanic was built and launched in 1911. Bordered in orange, it will adjoin a residual Harland & Wolff landbank, seen to the east with the yellow cranes Samson and Goliath. The wedged cut to the western side of the site indicates where the slipways for Titanic and Olympic were located. The building just below the eastern edge is the Odyssey Arena, and the bridge below it again carries the M3 motorway. In the bottom right of picture are the Waterfront Hall and Hilton Hotel respectively, with the city centre to bottom left. At top of picture is Belfast city airport. Titanic and Oympic side by side in the Arrol gantry (from an original glass negative in the Ulster Folk and Transport Museum). October 1910. Slipways 2 and 3, which housed Olympic and Titanic respectively, will come out of dereliction to become an open space with the shapes of the superliners picked out in black slate as a kind of shadow footprint of the glory that was. Fronting onto the River Lagan, where both liners made their baptism, will be a huge new sculpture entitled 'Grace,' which appears to be a stylistic re-imagining of the Women's Titanic Memorial in Washington DC. The Thompson Graving Dock, an authentic imprint of the liners, being just sufficient to accommodate them bow to stern, will also be the focus for a light-based artistic impression of a four-funnel giant. 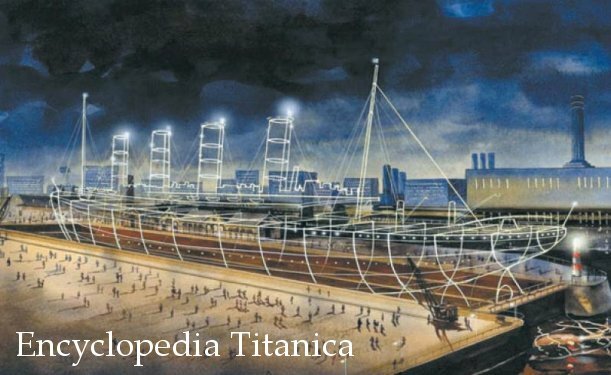 An artist’s impression of how the ‘Ghost Titanic’ idea could be luminously delivered by 2012 at the Thompson Graving Dock. 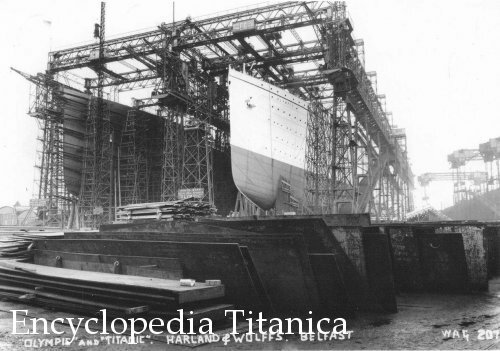 It will thus suggest the height of the Titanic - whereas the graving dock, when accessible, has thus far only indicated her impressive 46,000-ton draught. At the same time the vaulted building housing Drawing Room No. 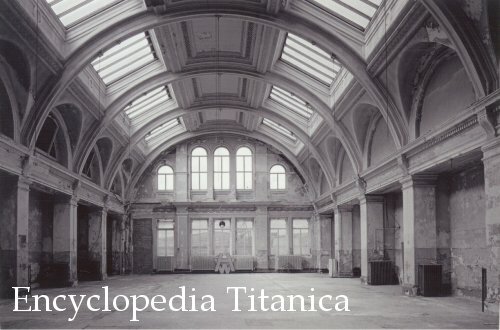 2, where the Titanic was first mapped out in blueprint, will be restored and opened as an exhibition space. The building, which also incorporated offices for Lord Pirrie and Thomas Andrews, has been left to descend into extremely poor condition in recent years. This is one of the oldest sections of Harland & Wolff offices on site. This Drawing Office is best known for its association with detailed construction designs for the Olympic class liners. The waterfront development on the historic site will be a mixed-use project with an emphasis on office space. There will also be residential projects, leisure complexes, education facilities, and a new-found determination to make the most of Titanic tourism. Titanic Quarter logo of the development company. 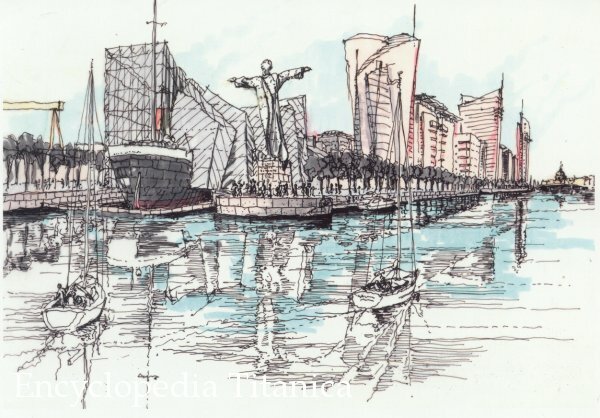 The Titanic Quarter project is conceived by Harcourt Developments of Dublin on behalf of Belfast Harbour Commissioners, with 50pc backing from billionaire financier Dermot Desmond, owner of London City Airport and much of Celtic football club. The Gateway office building will be the first erected, at the junction of the Queen’s Road (seen in the 1912 yard photo, elsewhere) and Sydenham Road. The glazed atrium will convey something of the prow of a ship. It will create 20,000 jobs and is expected to be completed by 2012, in time for the centenary of the sinking. American architect Eric Kuhne has designed the masterplan for the Quarter, telling journalists this week that it would be made up of a series of intimate districts. Every person in the area, whether worker, resident or restaurant patron, would be never more than 250 metres from either a unique garden or waterfront boulevard, he said. But he also insisted the project would reflect Belfast's extraordinary maritime heritage. 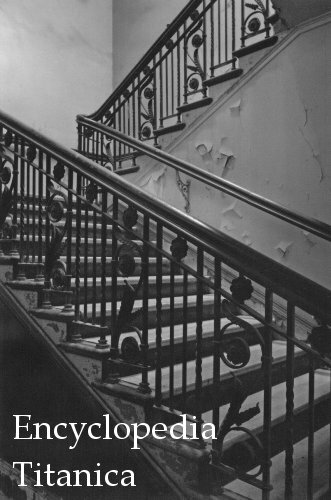 An ornate but crumbling staircase in Drawing Office No. 2, said to lead to the ‘corridor of power’ where Lord Pirrie had his office. It will in future house part of the ‘Titanic Experience,’ a tourist amenity. The exhibition space will contain, among other features, a recreation of the Titanic Grand Staircase with Honour and Glory crowning Time, as well as the First Class dining saloon from the vessel. 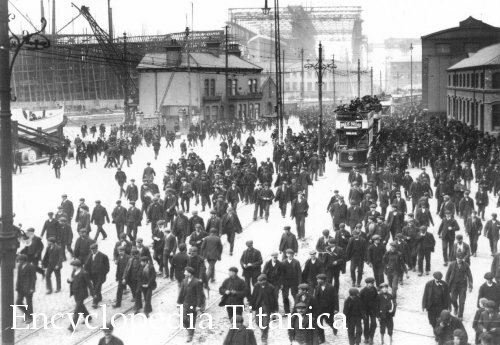 A number of important Titanic relics are expected to be acquired for permanent exhibition or loaned from private collections already in the city. Mr Kuhne said the challenge of the project was to celebrate Belfast's past status as a world leader in engineering and technological innovation, when the construction of giant liners drew every form of expertise to the city, including that of craftsmen and skilled artisans. One element of the site concept, taken from a launch brochure. The new vision for Titanic Quarter “creates that opportunity again through the building of a new community that restores the prestige of urban living in Belfast,” purrs the public relations material. It “establishes an environment for the new entrepreneurial class in the city to emerge,” Kuhne said. 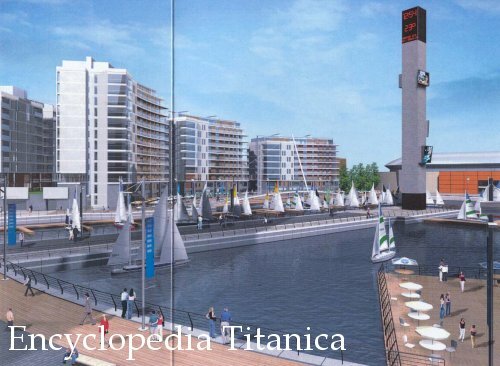 The result will be Europe's largest waterfront development, with 2,000 new homes. Northern Ireland Secretary Peter Hain hailed the significance of the plans, which he said presented an opportunity to re-establish Belfast and Northern Ireland as a great place to visit, invest in and live. A photo taken of the shipyard in May 1911, most often cropped heavily from the left. A series of new buildings will arise in this area from the ashes of industrial desuetude. The plans were presented to more than 200 civic and business leaders in the grand drawing room were the Titanic was designed. Mr Kuhne forecast that the success of the Northern Ireland Science Park, already established on H&W land on the edge of the new Quarter, would be mirrored in the new suburb. The science park has attracted investors such as Microsoft and Citigroup. Mr Kuhne said: “This will be no dormitory development. The pattern of parks, streets and gardens and the localised retail, healthcare, and educational facilities will be designed to build a community centred on genuine social interaction and shared values. “It will be a new focal point for Belfast,” added the architect, who has designed waterfront projects on four continents, including Darling Harbour in Sydney and Mid Valley Gardens in Kuala Lumpur. Chairman of the Belfast Harbour Commissioners Frank Cushnahan said: “We see it as a catalytic project which will soon be known as the economic and leisure gateway to Northern Ireland.